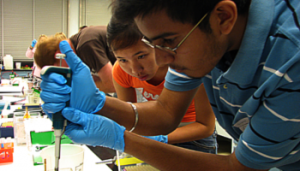 The Partnership for Biotechnology and Genomics Education (PBGE) project on the UC Davis campus involves two related components of secondary education focused on Science, Technology, Engineering, and Mathematics (STEM) concepts. The components include the development and distribution of innovative 3D virtual reality software and a highly successful laboratory equipment loan program with associated curricula for hands-on instruction in biotechnology for secondary schools. Modern biology-related scenarios developed by educator student-scientist partners will be translated into STEMware™ (immersive learning simulations for a virtual lab environment). Targeted toward secondary level students and educators, this cyberlearning resource will be distributed to afterschool programs, home computers, and school sites across the country. The project incorporates an innovative professional and youth development program in the creation, implementation, and evaluation of STEM based “serious game” software.